OS grid reference: TQ 7451 6083. The prehistoric burial chamber called Kit’s Coty or Kit’s Coty House stands in a field to the west of the Chatham road in the Medway Valley and the A229, 1 mile south-west of Walderslade. The famous Pilgrims Way is just to the south as is the Rochester road. The nearest town, Chatham, is 2 miles to the north. The ancient monument can be reached by a trackway running alongside the site from the south at Blue Bell Hill. At first glance the monument looks like a large stone shelter or a tiny house, but it soon takes on the form of a burial chamber, which is also referred to in other terms as a cromlech, dolmen or quoit. Although it dates back to the Neolithic age, it apparently takes it’s name from a 5th century Welsh prince called Catigern – hence we get “the house of Cati”. Kit’s Coty Burial Chamber, Kent. 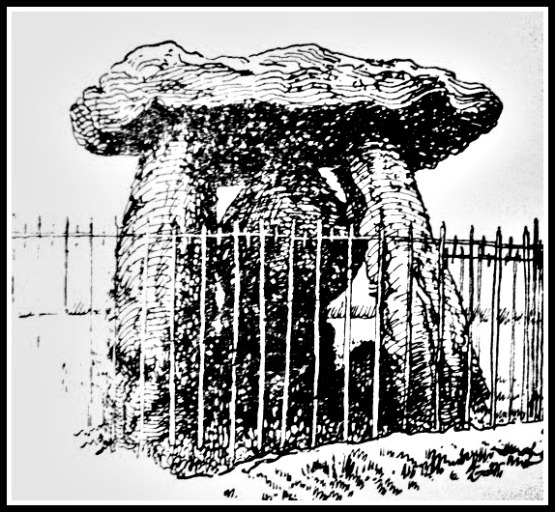 Originally the burial chamber was at the eastern end of a long barrow that was completely covered over by a mound that has now gone, while at the western end there used to be a large standing stone and another stone (a peristalith) that was known locally as “the General’s Tombstone”. Sadly this large stone was blown up in 1867 because it got in the way of ploughing the field. The burial chamber consists of three huge up-right slabs or sarsens 2.5 metres high with an equally large, overlapping capstone 4 metres long standing upon a small mound 1 metre high; originally this mound was 15 metres wide. The whole site of burial chamber and long barrow are roughly 70 metres in length. Today the monument is surrounded by ugly railings for security reasons. Although the monument dates back more than 4,000 years to the Neolithic age, the name is derived from a Dark Age prince called Catigern, son of Vortigern who, according to legend, died in a battle against the Saxons, under Hengest and Horsa, at or near Aylesford in 455 AD. 400 metres to the south, beside the Aylesford road, can be found another ancient monument called Little Kit’s Coty or “the Countless Stones” where there are a number of recumbant stones, which once formed a second burial chamber. No burials have been found at either of these sites. Categories: Burial Chambers / Cromlech / Dolmens, Kit's Coty Burial Chamber | Tags: Kit's Coty Burial Chamber at Walderslade in Kent | Permalink. Thank you John. Glad you enjoyed reading the post.